The New Jersey high school referee who forced a student wrestler to cut his dreadlocks or forfeit a match has filed a legal action claiming defamation of character and emotional distress, the Philadelphia Inquirer is reporting. 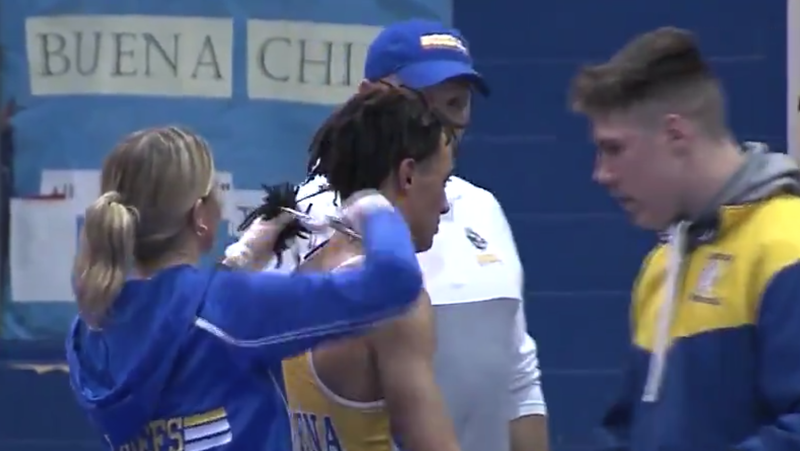 The referee, Alan Maloney of Buena Regional High School, attracted criticism from across the country after he forced wrestler Andrew Johnson in a Dec. 18 match to make the choice, prompting the student to have his hair cut on site. Maloney sent 12 potential defendants a notice of tort claim, considered the first step in filing a lawsuit, according to the Inquirer. The New Jersey State Interscholastic Athletic Association and officials and coaches with the Buena School District are among the potential defendants named in the legal action in which Maloney claims $100,000 in damages, the news organization reports. After the December incident, officials in Buena said Maloney would no longer referee local matches and the state association barred him from refereeing until the completion of its own investigation as well as another by the New Jersey Division of Civil Rights, the Inquirer reported. Buena is in the southern region of New Jersey about 38 miles west of Atlantic City. A lawyer for Johnson and his family told the news organization that he believed Maloney’s action was typical for someone in his position. The incident reopened a new chapter in the debate over the treatment of Black people who wear their hair in natural styles. In New York City last month, the local government banned the mistreatment of people based on hairstyle. Word of the incident spread quickly after video went viral of a wrestling trainer cutting Johnson’s hair as he stood on the mat with an apparent look of distress on his face. Maloney’s lawyer, Ralph Paolone, a wrestling coach in Absecon, N.J., did not respond to Inquirer telephone and email messages.